As Intel goes so goes Windows 8. The chipmaker just unveiled its roadmap for Window 8 tablets. At the core will be the latest generation of Atom processors: quad-core architecture at a 22nm size. 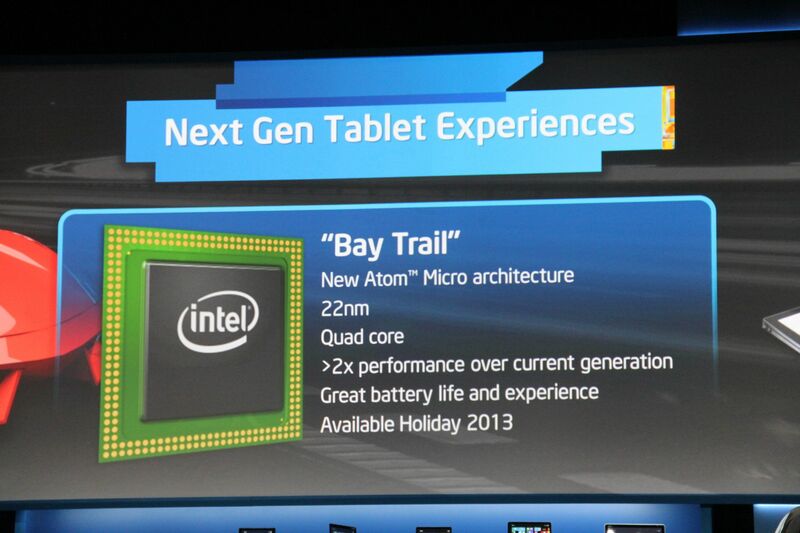 Intel calls it the Bay Trail and expects to see it within shipping hardware in late 2013 — including Android tablets. With this latest chip, Intel is reconfirming its commitment to Windows 8. Microsoft has big, perhaps too big, expectations for Windows 8, but without the proper hardware, consumers will never see the true proper and capabilities of Windows 8. Windows 8 has yet to see a pop in the marketplace for several reasons, but lackluster hardware is one of the biggest. Outside of several flagship products, there isn’t a large variety of novel form factors. The same thought could be said for Android as well. Intel is quickly embracing the Android platform and Intel showed off a Bay Trail tablet today as well. The upcoming platform will sport twice the performance of the current Atom SoC generation. But actually more importantly the next-generation will allow for thinner devices with longer battery lives. Intel knows the x86’s strength and wasn’t afraid to talk about at its CES 2013 press conference. Windows 8, which Intel currently embraces, can run any Windows application. That’s not the case with Windows RT products, which require ARM-based processors. It’s the one major downfall to Windows RT and products like the Microsoft Surface. However, Windows RT tablets are currently on the market and offer better battery life, thinner cases and lower prices. Intel-powered tablets are still bulky with some requiring fans to dissipate the heat generated by Intel’s chips. If Intel is successful with Bay Trail in 2013, Windows RT doesn’t stand a chance.